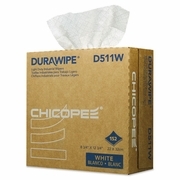 Chicopee Durawipe Light Duty Industrial Wipers, 8.8 x 12.8, White, 152/Box, 12 boxes per carton. SOLD BY THE CARTON. Light duty wipers are ideal for cleaning and absorbing liquids and solvents. Soft, durable wipers. Wipers are designed with a cloth-like feel. Economical for everyday use.